Verbs With Spelling Changes in the Present Tense P. 449 Realidades 2. 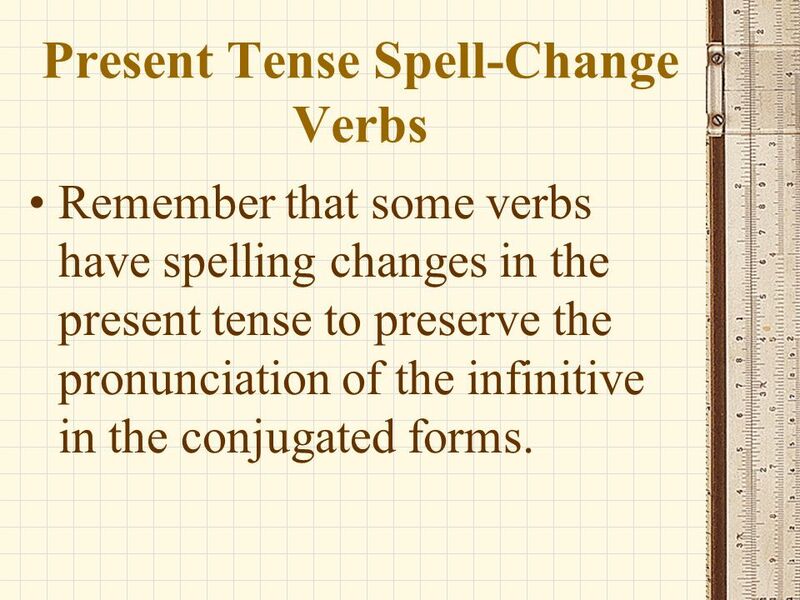 3 Present Tense Spell-Change Verbs Remember that some verbs have spelling changes in the present tense to preserve the pronunciation of the infinitive in the conjugated forms. 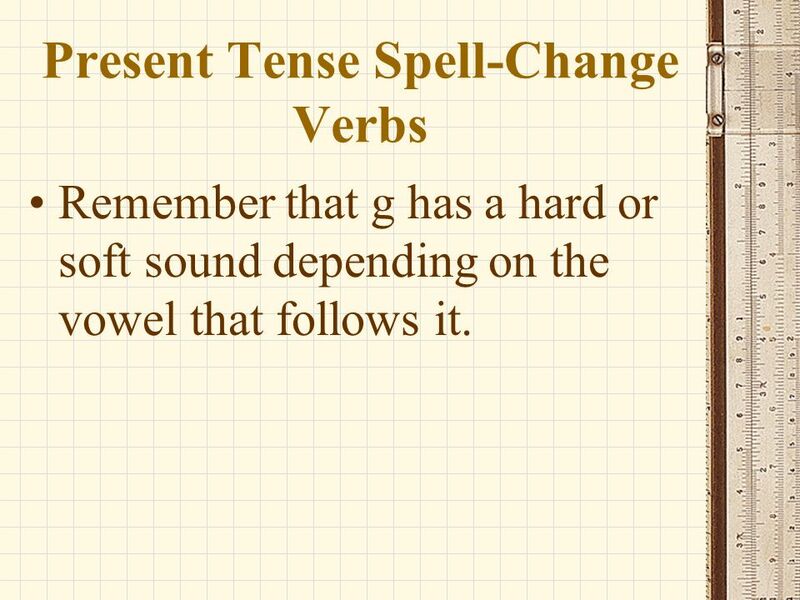 4 Present Tense Spell-Change Verbs Remember that g has a hard or soft sound depending on the vowel that follows it. 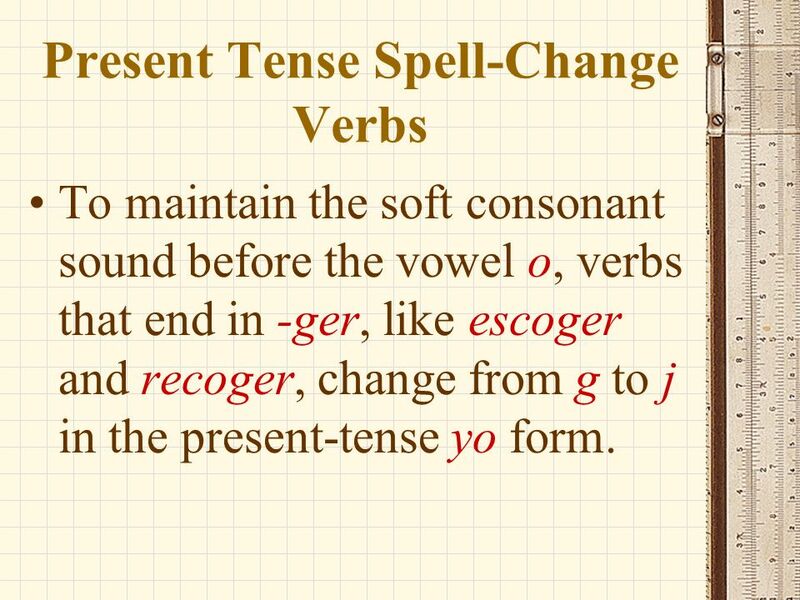 5 Present Tense Spell-Change Verbs To maintain the soft consonant sound before the vowel o, verbs that end in -ger, like escoger and recoger, change from g to j in the present-tense yo form. 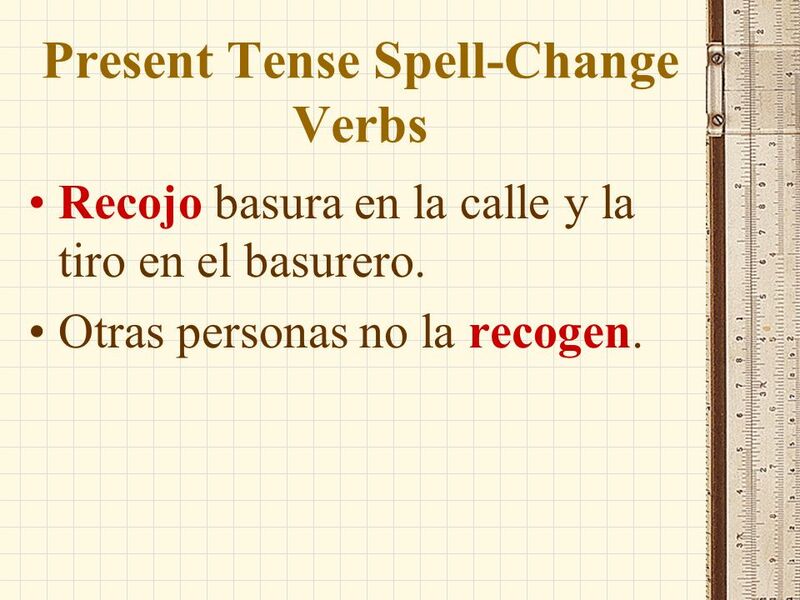 6 Present Tense Spell-Change Verbs Recojo basura en la calle y la tiro en el basurero. Otras personas no la recogen. 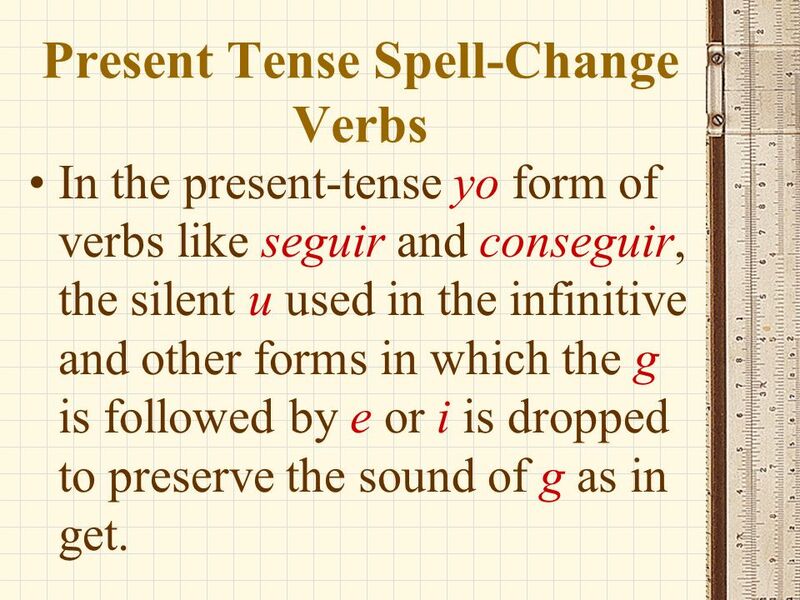 7 Present Tense Spell-Change Verbs In the present-tense yo form of verbs like seguir and conseguir, the silent u used in the infinitive and other forms in which the g is followed by e or i is dropped to preserve the sound of g as in get. 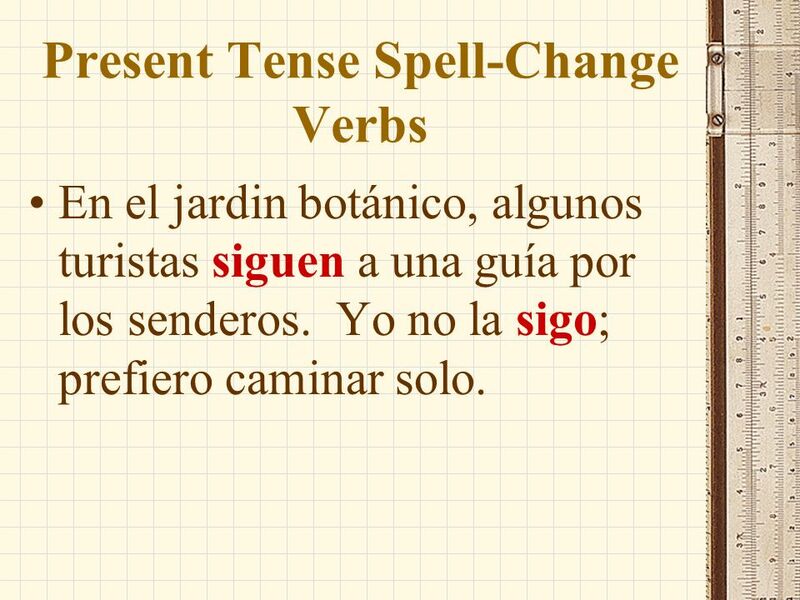 8 Present Tense Spell-Change Verbs En el jardin botánico, algunos turistas siguen a una guía por los senderos. Yo no la sigo; prefiero caminar solo. 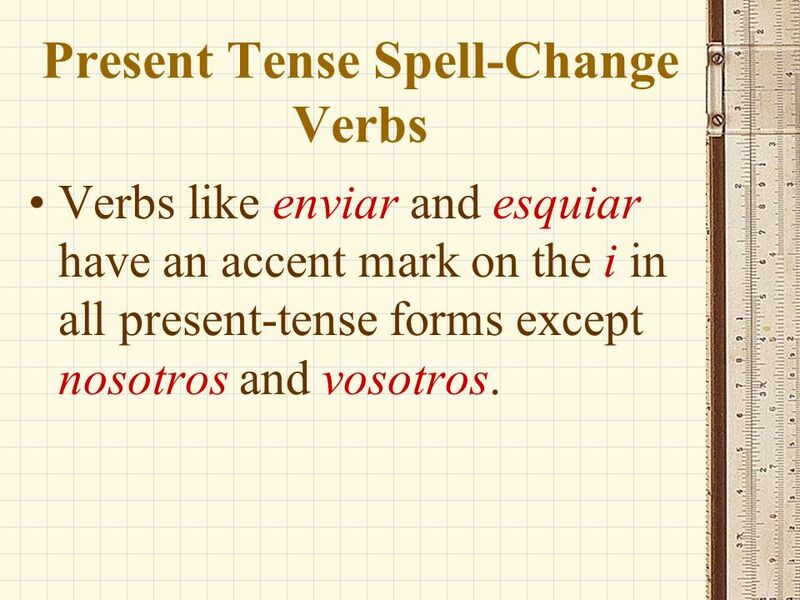 9 Present Tense Spell-Change Verbs Verbs like enviar and esquiar have an accent mark on the i in all present-tense forms except nosotros and vosotros. 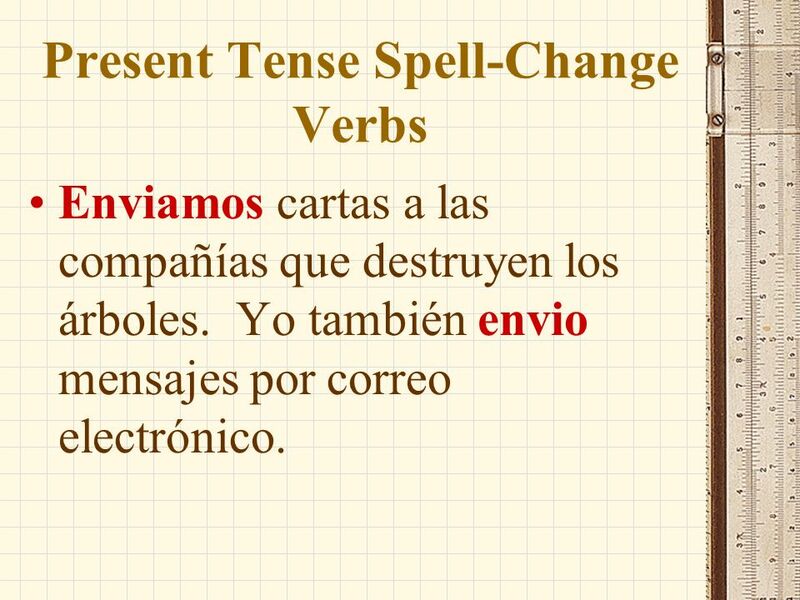 10 Present Tense Spell-Change Verbs Enviamos cartas a las compañías que destruyen los árboles. Yo también envio mensajes por correo electrónico. 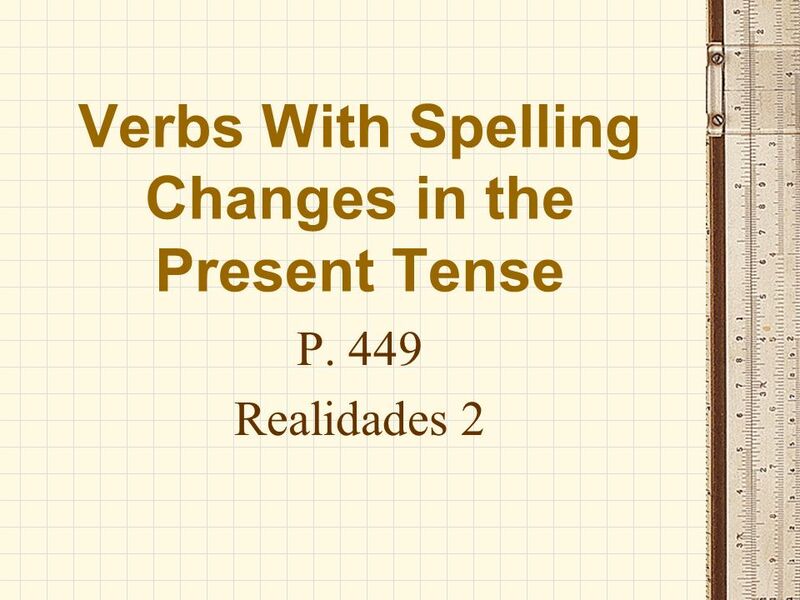 Descargar ppt "Verbs With Spelling Changes in the Present Tense P. 449 Realidades 2." Stem Changing Verbs: o-ue ANTE TODO Stem-changing verbs deviate from the normal pattern of regular verbs. In stem-changing verbs, the stressed vowel of. En casa con la familiaGramática 1 Stem-changing verbs: o ue Preview Stem-changing verbs Almorzar, volver and llover Dormir hastaormir hasta Master Teacher. En casa con la familiaGramática 1 Stem-changing verbs: e ie Preview Stem-changing verbs Empezar a. Present tense of Stem-changing E to IE words a.Many verbs that contain e in the stem, change the e to ie b.This change occurs in the syllable directly. In Lección 2, you learned how to form the present tense of regular -ar verbs. You also learned about the importance of verb forms, which change to show. Asking Questions P. 184 Realidades 1. The Verb Jugar P. 208 Realidades 1 The Verb Jugar o In Spanish, the verb jugar is used to talk about playing a sport or a game. o Even though jugar uses. Page 107 Realidades 1 ESTAR The Verb Estar Estar is considered an IRREGULAR verb because it does not follow the pattern of Ar verb exactly. It means. Lunes el diecinueve de marzo. The future tense is used in Spanish to talk about future events. It is used when ever we would use the phrase I will… in. Both Spanish and English use the present progressive, which consists of the present tense of the verb to be and the present participle (the -ing form in.